This post is the sixth in a series looking at the draft specifications published by the exam boards and the second looking at the A-Level options. You can find previous posts in the series by clicking here. 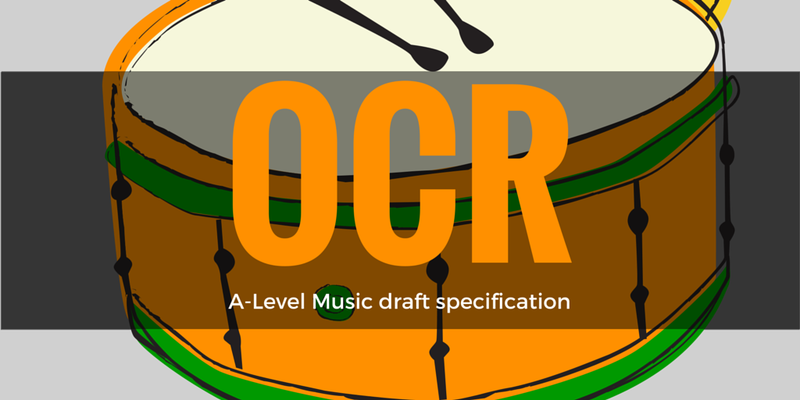 Today, I’m looking at OCR’s A-Level specification, which you can download from their website here. It seems a petty point but I find it strange that the length of the first four units goes ‘short-long-long-short’. My brain would have found it easier to cope with ‘short-long-short-long’ but maybe that’s just an obsessive desire for order and symmetry on my part. The ability to construct a course around the specific strengths of learners is very welcome and, to me, this seems preferable to AQA’s one-size-fits-all approach of weighting the entire course towards performance. This integrated approach seems entirely sensible to me and it’s nice to see an exam board being explicit about this expectation rather than encouraging a discrete approach to each skill simply because that’s easier to assess. I find it interesting and, if I’m honest, a little surprising that there’s no area of study looking at recent popular music. I’m pleased to see that popular music features in a mandatory area of study but it seems odd to limit this to blues, jazz, swing and big band music. A somewhat non-committal but, nonetheless, welcome way of giving encouraging a synoptic approach when teachers design their scheme of work for this course. As with Edexcel, the recital must be completed between 1st March and 31st May in the year of certification. No great surprises here considering Ofqual’s requirement to include a composition to a brief. OCR has been slightly more prescriptive than AQA in stating that the ‘free composition’ should be in response to a learner set brief, whereas AQA says that a brief is optional for the second composition. In all honesty, I welcome the requirement for learners to set a brief as I believe that this is both a more realistic take on what it’s like to be a composer and is likely to result in better compositions. I always encourage teachers to ensure that compositions are in response to a brief or, at the very least, a title (whether it’s set by the exam board, the teacher or the student doesn’t matter to me). Those who opt for the longer composition unit will also have to submit “three short technical exercises”, which may or may not be welcome news to learners who opt for this pathway. I certainly see the sense in OCR taking this approach for the A-Level course but I suspect that some candidates may have preferred to submit a third composition instead. Each section of the exam requires longer answers from candidates and is worth more marks than the last.